Functions are the basic units of reusable logic. A function is a piece of logic that takes any number of arguments, performs some operations and returns a result of these operations. Functions in Luna are also ordinary values, so you can pass them around freely. Most nodes you have used so far are actually functions. In this chapter you&apos;ll learn how to use functions and how to define them. Calling functions in text is accomplished by passing space–separated arguments. 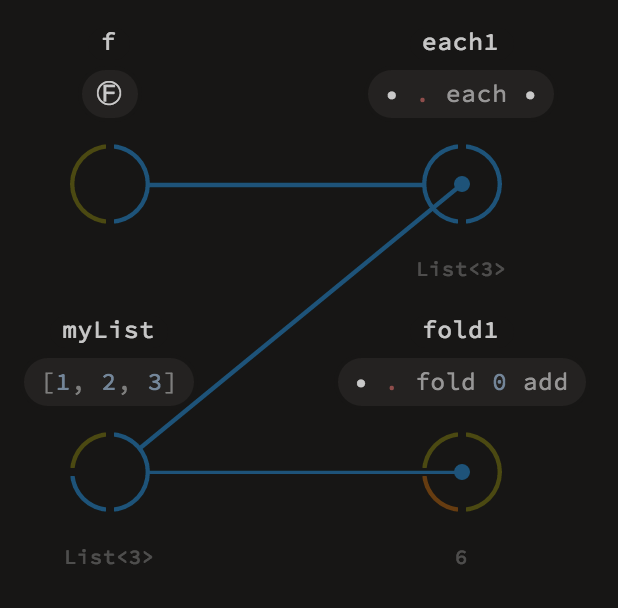 In the visual graph it corresponds to setting the values of respective input ports on a node – either by connecting other values to them or setting the values in the expression or by using port controls such as sliders. Since functions are ordinary values, they need to have a type (all values in Luna are typed, remember?). The type of function taking an argument A and returning a B is A -> B. It&apos;s easy to remember when you think about the arrow as representing a transformation from type A to type B.
Multi–argument functions are typed using more arrows – for example a function taking a Real, an Int and returning a Text would be typed as Real -> Int -> Text. The last part of such an arrow chain is the return value, while all the parts before are consecutive arguments. 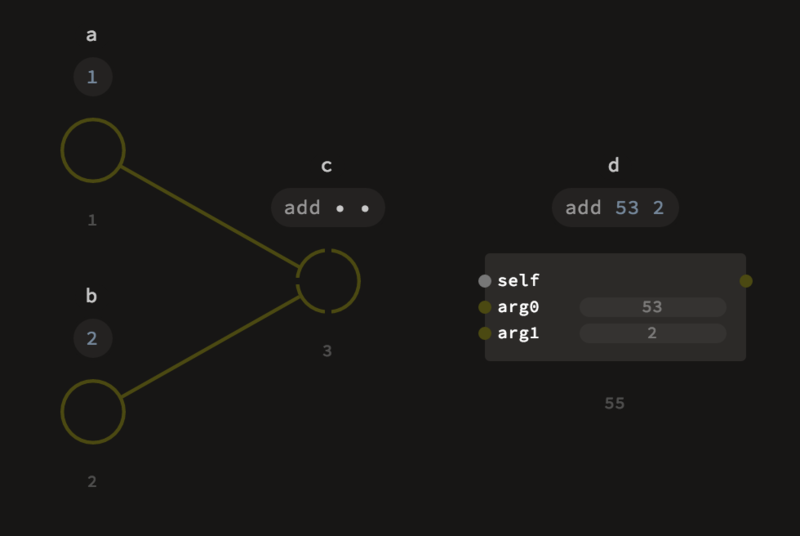 The add3 node applies the first argument and leaves the second one. There is no need for the _ in this case, since the applied argument precedes the unapplied. The type is the same as that of add2, since both arguments have the same type. 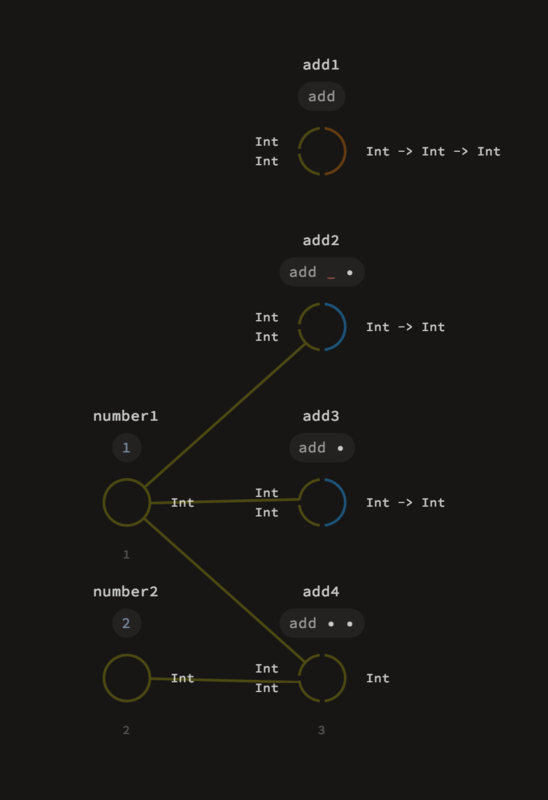 The add4 node is fully applied, so the return type is just Int.